Marketing, essential needs and toxic needs. In LP Workbook Two we talk about marketing and how it subverts healing by aiming at our Seven Essential Needs and our Toxic Needs and using those to sell us product, which don't really meet our needs. 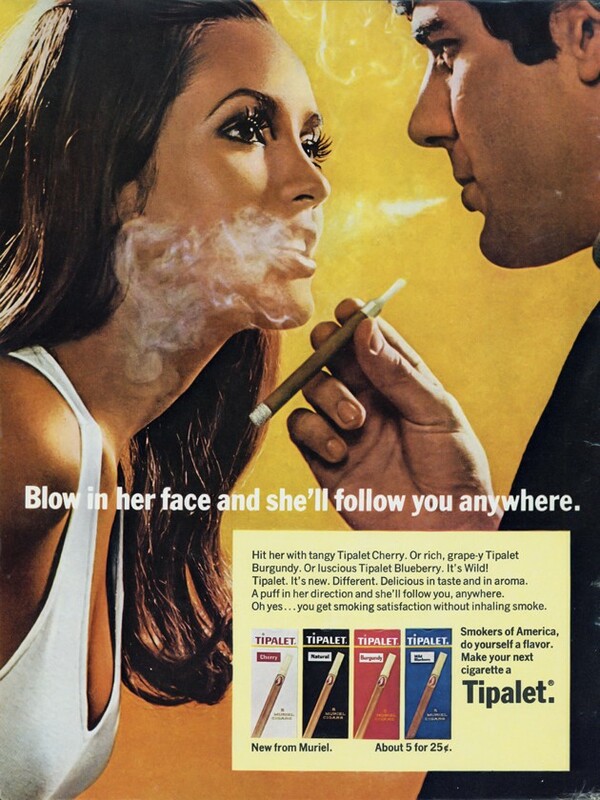 Here are a few horrific ads from the 70s. What toxic needs or essential needs do you think the advertisers are aiming at here? Feel free to post your own examples of ads aimed at exploiting our human needs. The adds you posted are really increadible... I have never seen something like this and hard to believe that the women just walked by such an add without being at least irritated; or even that the society accepted this, not only women. First of all I notice that all adds are targeting at the male consumers. It creates an impression that men are superior then women and that they can do with women what they please, "put them where they belong", etc. 1) essential need to get a sexual partner. it looks like no work from male’s side is involved in finding a female partner. The adds offer a miraculous solution (which people tend to believe): "get these cigarettes and you will be the king." 2) Toxic need of control and of being superior. But at the same time this could be the essential needs of love, self esteem and power as well. From recent adds I have been always stroke, when I have seen nicotine or alcohol adds. But especially nicotine adds, because they promise freedom. They are created so artistically and present such a state of freedom that one really would want to smoke. I did not find "freedom" on the list of the essential needs on the SpiritWiki. It is maybe/probably implemented in one of the other ones? Or is it not a need? Or, if we would not feel like in “prison”, we would not have this need for freedom. In that case it would be a toxic need. I am not sure. I have a tendency to think that it is rather essential. Freedom and Mastery over one’s nature have been the aims of Yoga or other spiritual traditions. I think freedom is very deep need of which many are not even aware, while living in this kind of prison of modern society. I wished to become free. Not even from something specific, but kind of from everything; even from being human. The popularity of such movie like "Matrix" shows (among other things) this possibility of becoming free and of escaping the system (not essential need) - things that attract people nowadays. But human being needs both: freedom and inclusion. I think. Evidently alcohol and nicotine offer an escape form this "boring, unbearable, etc. reality", what people seek as well as the “awareness reduction”. But this they do not show in the advertisement. It could also be that "freedom" is a rather modern "need". As there is also a noticeable change in adds after the movement/wave of individualisation process. Suddenly all adds address the Individual. "This dress is JUST FOR YOU..." I think individualisation is a very important, necessary movement, but not the final. I also think there is a need in people and we can see it clearly in children and in teenagers, to be something special, unique, the only one. And I think there is some truth in this need, since each one is unique, but the expression of it is difficult; or the demand for it. Or I have been recently moved by the adds in cinema in Germany; the ones advertising newspapers and beer. They gave this impression one can do whatever one wants; life is so rich and one can experience everything, do everything, everything is possible, live free “like a king”. I think it speaks to the vital/emotional part oft he being. TO be free and to have fun! It is something people want. These awaken some kind of hope or maybe desire. But I think there is a need for this freedom and joy in life and we maybe have right for that. I think you are right about freedom and it is a need. I would put freedom in the Esteem/Power need, Essential Need five, because esteem and power are precursors to freedom. You can't feel free if you don't feel confident and you can't be free if you don't have power. Thus essential need five becomes esteem/power/freedom. Thank you for taking "freedom" into the list and for this friendly footnote. I am still thinking about that question, if freedom is essential need or a toxic one. Let's say, if we would be connected and feel the unity with others and everything, and ideally live in better environment, we would not have this need for freedom? Now we experience the lack of freedom at so many levels. There is a need for the freedom of action, of power, of choice, etc. So, the advertisers can "get" us easily. I have to admit that sometimes I wish to be free just from everything; even from being human. On the other hand in a better/ ideal environment, we would not even think of the freedom as of our need. Freedom would be a basic condition, would go without saying in such an environment. I am wondering now, if this feeling/ need of freedom is in contradiction with the feeling of Oneness? But at leas at the physical level of existence - freedom is a need; even if we choose to seek for unity and to live in unity with others - we have to choose it. I agree with Michael here. The need for freedom seems to be essentially the need for power. Think about it. What is power? Power is the ability to do something, basically whatever you wish to do. It is, essentially freedom. If you have power, you automatically have freedom. How could any person who has power not have freedom at the same time? Would we still state that person is powerfull, if we see that the person is in chains? I think that we might state that freedom is just another word, a more specific one, for power. Freedom is power in the mental realm. If you are free, you are free of what binds you. You can do whatever you wish. This, to me seems quite similar to the sentence above that described what power is. Moreover, freedom would mean that one is free from the inner chains. These chains being the conditioning one has that chain us. 350 years ago, Leibniz wrote that being free means essentially being your true self. It means you are able to do what you realize is best. To answer your concern concerning the relation of freedom and oneness. They are not contradictory. Freedom is related only to the conditioning one has. The issue can be depicted in an easy fashion. Do you do what you think/feel is good? Or do you abide by some external, or internal rules? Leibniz put it quite nicely. He said that freedom is achieved by actualizing yourself. He essentially meant the same thing that Maslow described as a need later on. If we take Leibniz' definition, which seems plausible to me, we may recognize that freedom and oneness are not contradictory concepts. Freedom, gained by actualizing yourself, by becoming your true self, does not necessarily contradict any feelings of oneness. In fact, it supports this feeling. At least, as long as the person is in an alligned state. This is key here I feel. Only in a situation where you are not aligned, is it possible that feelings of belonging and oneness "contradict" feelings of freedom. But, since genuine freedom actually requires actualization, and actualization implies allignment, it is not really possible that genuine freedom contradicts feelings of belonging. (At least not in a world that is not horribly unaligned, like ours for instance). So, my conclusion is this: In our wolrd, it is possible for the two concepts to be contradictory, due to its unaligned state. In a halfway aligned world, the two concepts are perfectly compatible with each other, even support each other. Thank you, Aim, for your thoughts concerning freedom and oneness. I understand, what you write. I think I do. Your language is not always very easy to understand for me. But I am probably not as convinced as you in this regard. But it is so because of my mind, you know. For a not enlightened mind at this physical level it is impossible to unite contradictions or to understand no beginning and no end. For the mind everything is only either white or black - not both. "we might state that freedom is just another word, a more specific one, for power." and about this I am really not certain. Freedom could be Power. But is it always the case? I mean, we are still talking about the physical reality. One can have power and not be able to do what one wishes to. Though, the powerful person has maybe always the power of choice. Maybe not very clear. I give an example. It is from the autobiography of one powerful person, who I think was truly great. She was attacked by people, living next to her, pretending to be her friends, etc. One her true friend asked her: "You are so powerful! Why don't you just fight back? Finish them?" She was doing a special work and she said that it makes no sense to finish them. Since it is not their personal egoistic resistance, but the resistance of the whole earth. Many people on earth would experience the same resistance. So, one can't finish the whole earth. It is a long process of transformation. I am not sure if it is the best example. But I think that people with true power sometimes freely choose to do the lesser action. They can't do just what they want. You are probably right, and freedom is not possible without power. But there are different types of freedom, which might be able to achieve without power. And power doesn't always mean freedom in my opinion... These are just thoughts. I might be wrong, of course. Post Reply: Marketing, essential needs and toxic needs.